When it comes to protecting your home from water, two is always better than one. Dual solutions tend to work better because they not only give you piece of mind–they work. Battery backup sump pumps provide protection against flooding when your power goes out, and that’s a big stress relief when you’re stressing about the storm. During some severe spring storms, power is often lost, shutting down your old sump pump system. In these cases, a battery backup sump pump will automatically turn on and provide flood protection for your basement until power is restored. For those of us that have experienced basement flooding, a battery backup is not a luxury but a necessity. You have other things to worry about, why not make the investment in a battery backup sump pump and give yourself permission to worry about one less thing around the house. Earth Contact Products (ECP) battery backup sump pump systems monitor your whole waterproofing system with a controller and then switch your sump system from AC power to DC power when there is an interruption in electrical power service. This system will then recharge the battery once AC power is restored. Audible alarms will inform you of this instance but no action is needed on your part for most systems. Some systems can even call your phone and inform you of an interruption so that you are warned about your freezer or other appliances. As with AC sump pumps, DC battery backup units vary in performance and features. Gallons per hour and efficiency are the keys to picking the best system. If the system is not efficient, it will drain the battery quickly and put your basement at risk. Also, if your backup cannot keep up with the amount of water entering your sump basin, your basement could be flooded. Insist on ECP sump pump systems to protect your home from flooding. We can help you determine what type of system will be best for your home. 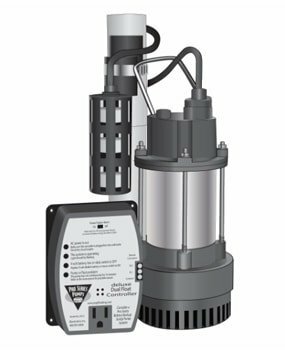 Contact us today to learn more about battery backup sump pumps. We offer a variety of options for our customers when it comes to sump pumps and battery backup sump pumps. Keeping your drainage and water protection systems up to date can help save you time and money. Having your home flood can damage your possessions, your foundation, and more. This can leave you to replace possessions and repair your foundation, which can be very costly. If you know your home is in danger of flooding, having a sump pump and a battery backup sump pump is incredibly important. Contact Reliable Waterproofing & Masonry for more information on our services.